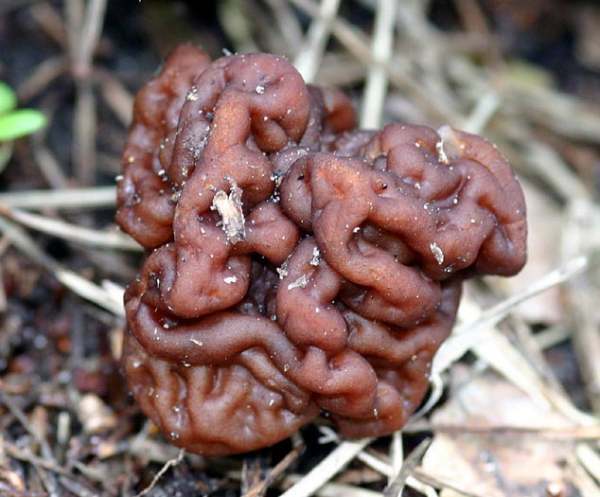 Gyromitra esculenta, commonly called the False Morel or the Turban Fungus, is deadly poisonous. Unfortunately it is sometimes mistakenly collected by people looking for Morels Morchella esculenta. Most worrying is the specific epithet, because esculenta means 'good to eat', and in some Eastern European countries this morel imposter has long been treated as an esculent; fortunately nowadays the risks are becoming more widely understood as people who forage for fungi get 'web connected'. Widespread but rarely recorded and very localised in Britain and Ireland, Gyromitra esculenta occurs in sandy soil most often beneath pine trees. Found throughout Europe, this toxic fungus is also recorded in many parts of North America. Described in 1800 by Christiaan Hendrik Persoon, who gave it the scientific (binomial) name Helvella esculenta, the False Morel acquired its currently-accepted scientific name in 1849 when the great Swedish mycologist Elias Magnus Fries moved it to the genus Gyromitra. Synonyms of Gyromitra esculenta include Helvella esculenta (Pers. ), and Physomitra esculenta (Pers.) Boud. Gyromitra, the genus name, comes from the Greek words gyros, meaning round, and mitra, meaning a headband, The extent to which this mushroom resembles a round headband I shall leave to your imagination. The specific epithet is much easier, however: it comes from the Latin esculentus, meaning edible - one of the world's worst misnomers, but Persoon was unaware of the issue when he established the basionym of this toxic toadstool. For centuries these morel-like fungi have been gathered and eaten by people in Scandinavia and Eastern Europe and, no doubt, to a lesser extent, elsewhere in the world. The toxin within these fungi has been given the name gyrotoxin, and its chemical structure is well understood, although exactly why and how it poisons people is less clear, but somehow it destroys red blood cells. Gyrotoxin is also known to be carcinogenic. The level of toxicity in Gyromitra esculenta varies depending on location, those in Eastern Europe seemingly much more dangerous that specimens gathered in North America, for instance. False Morels picked high in mountainous terrain have been shown to be less toxic that those gather in lowland pine forests. Cooking has been shown to reduce the toxicity, but even well-cooked False Morels have caused poisoning, so cooking is not a guarantee of safety, as there is evidence that repeated meals of these fungi cause a build-up of toxins in the body. Early symptoms of gyrotoxin poisoning include stomach pains, sweating and vomiting leading to dizziness and in some cases coma. Gyrotoxin affects the central nervous system and goes on to damage the victim's liver and possibly also the kidneys. If consumed in lethal doses (and a small dish of these fungi can be more than sufficient even for an adult, and children are even more vulnerable to gyrotoxin poisoning than adults are) then death may ensue typically five days to a week after eating the fungi. Conclusion: these are deadly poisonous fungi that have killed many people already - let's not join them! The red-brown cap is irregularly lobed, rather like a brain, and is usually broader than it is tall. Rounded margins to the contortions result in irregular hollow chambers inside the cap. Caps range from 5 to 15cm across and 4 to 8cm tall. The stipe is 2 to 3cm across and 2 to 5cm tall; creamy-white and fragile. Inside the stipe are several irregular tube-like hollows. Clavate, 5-10μm in diameter; reddish brown. Ellipsoidal, smooth, 8-13 x 17-22μm; hyaline; usually with two small oil drops (guttules) but occasionally multiguttulate. In coniferous woodland; rare in the lowlands but more common in mountainous regions. Morchella esculenta, the true Morel, has a deeply pitted cap and a single hollow chamber; its stipe is usually longer than that of Gyromitra esculenta. Helvella crispa has a creamy-white contorted saddle-shaped cap and a stipe with longitudinal tube-like hollows. This page includes pictures kindly contributed by Paul Condy and Simon Harding. Michelot D, Toth B (1991). 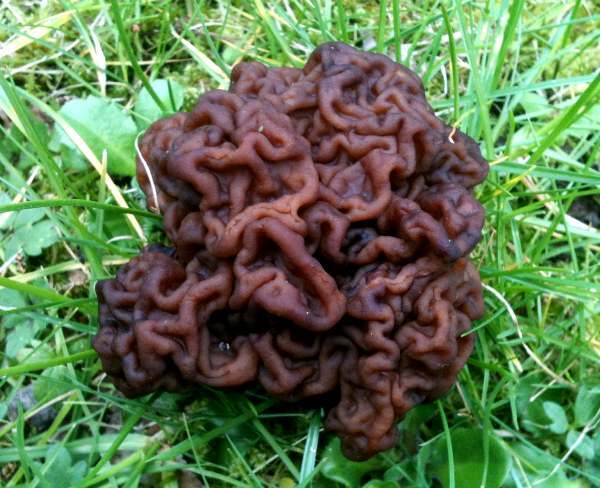 Poisoning by Gyromitra esculenta - a review. Journal of Applied Toxicology 11 (4): 235–43. Benjamin, D. R. (1995). Mushrooms: Poisons and Panaceas - a Handbook for Naturalists, Mycologists and Physicians. WH Freeman and Company. ISBN 0-7167-2600-9.